For the first 78 minutes it looked like the Wigan Athletic we took pride in watching in late summer. That positive attacking approach had returned with Nick Powell orchestrating from midfield and the home defence being stretched by Wigan’s nimble wide men. With Latics 2-1 ahead Reading goalkeeper Martinez made an outstanding point blank save from Nick Powell when a goal had looked certain. But Latics took off the tiring Massey and Powell after 73 and 78 minutes and the game swung back in Reading’s favour. Following the last minute defeat the social media and message boards were awash with fans voicing their frustration with the manager’s substitutions and his tactical nous. So often this season the starting lineup has given us a pretty good idea of what to expect. It was certainly the case in this match with the manager reuniting the trio of Michael Jacobs, Gavin Massey and Nick Powell who had been behind so much of the good football that has surfaced during the manager’s tenure. Moreover, he had benched the ineffective Leon Clarke for Joe Garner and, at last, brought in his specialist left back Antonee Robinson. He also brought experience into the centre of defence in a potentially tense encounter by bringing in Jonas Olsson for Cedric Kipre. The starting lineup gave us promise that we could expect good football, far apart from the hoofball/scrapball approach we have seen so often in away games. To be fair to the manager it was the first time since August that Jacobs, Massey and Powell had all been fit enough to be included as a trio in the starting lineup. If they had not suffered from those long-term injuries Latics would surely not have been locked in a relegation battle at this point of the season. Cook certainly got his starting lineup right but there was going to come a time in the game when he would have to take off some of his key players. The question was who would it be and how many would he have to substitute? Olsson had not played competitive football since December. Robinson’s last game was on November 10, but he had been back in contention for a matter of weeks and it had been a surprise that Cook had not given him any game time before this match. Given previous injuries to his attacking trio Cook would need to be careful not to risk more problems by overextending the members that attacking trio. The manager knew beforehand that he would have to make substitutions at some stage and had the time to draw up contingency plans. His challenge was to be how he could make the substitutions yet maintain the positive momentum built up by his starting lineup. In the event Cook replaced Massey with Kal Naismith and Powell with Leon Clarke. 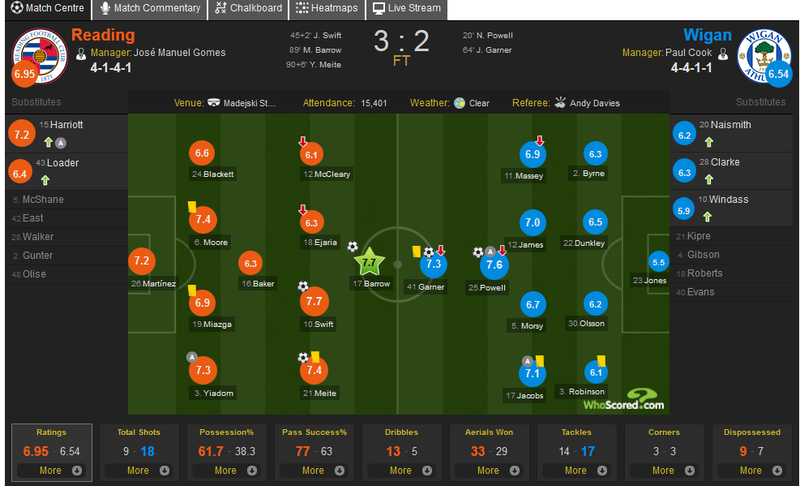 His substitutions wrecked the 4-2-3-1 shape that had been working so well and destroyed that momentum. Naismith was like a duck out of water on the right wing. 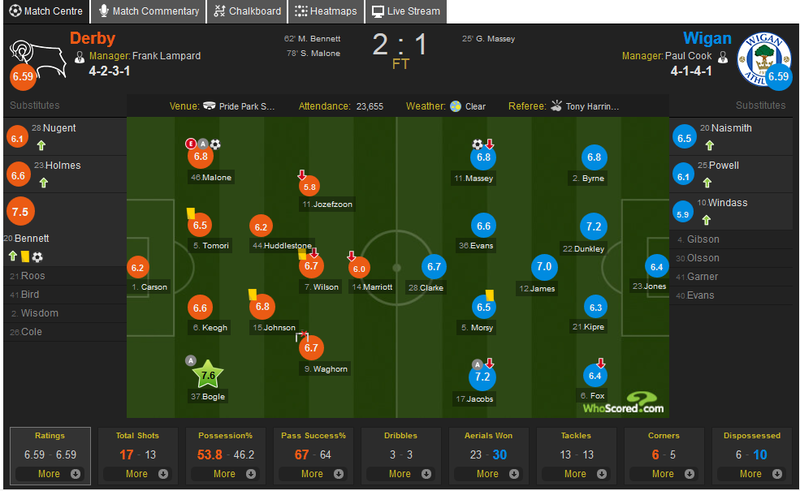 Clarke was simply ineffective and his presence invited long balls from defenders with possession being squandered. Cook shot himself in the foot with the comment that “Tactics, formations, that hasn’t influenced the game today” after seeing how his substitutions saw a change from flowing football to the fightball approach that has reared its ugly head far too often. Despite the manager’s ineffective substitutions Latics could still have come away with points had “luck” favoured them a little more. If Powell’s shot had not been somehow blocked by Martinez Wigan would have had a two goal cushion and Reading’s morale would have taken a severe hit. Reading’s second goal was certainly controversial with the home team on the edge of unsporting behaviour after the referee had dropped the ball to Sam Morsy. The result was a lack of midfield cover with Reece James off the pitch and Morsy marooned on the half way line. Barrow ran through unmarked to hit the type of long-range shot that can beat Jamie Jones. The winning goal in the 97th minute was scored after Olsson had been jostled to the ground in the penalty box as the set piece was launched. Reading had been putting constant pressure on the referee, as do so many teams in this division. The calls for Cook to be replaced have intensified. Although we on this site have previously advocated that he be given more time the worry is that the manager just does not seem to be learning from his mistakes with his team selections, substitutions and tactical approach. Darren Royle and IEC have been supportive up to this point but are they willing to continue to back a manager and backroom staff that could take the club back to League 1? 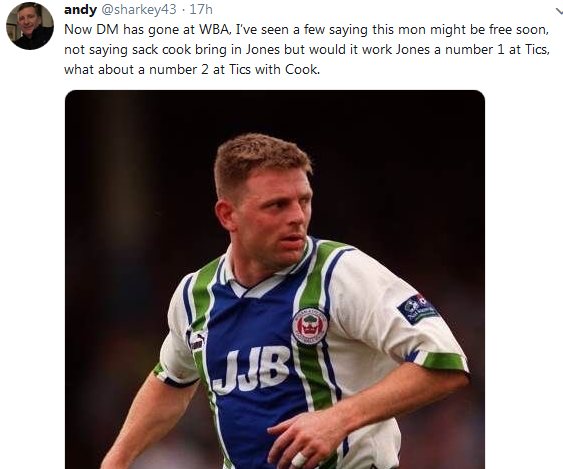 If Cook were to go would the highly experienced Peter Reid or Joe Royle take temporary control? Or would a snap appointment be brought in from the outside? It had been one of Wigan’s better away performances: a goal up after 25 minutes following a superb counterattack, the home team not looking like they were going to score. Then after 62 minutes Derby substitute Mason Bennett scored a truly spectacular goal that radically changed the game. Wigan’s fragile confidence was severely dented to such an extent that it was no great surprise that the home team scored again 16 minutes later with the Wigan defence all at sea. On paper Derby had a stronger lineup than Wigan. Even without players of the quality of Tom Lawrence and Mason Mount they had enough talent to ask questions about a suspect Latics defence. Nevertheless, Derby came into this game after three consecutive league defeats and their play had been fraught with errors. With the home team so nervy and with Latics a goal up going into the interval it was an opportunity for a rare Wigan away win. Wigan had been unfortunate to be deprived of the experienced and influential Danny Fox through injury after 33 minutes. Would the defence be able to withstand the Derby pressure in his absence? Mason Bennett is by no means a prolific scorer with a record of 6 goals in 90 league appearances. Latics can certainly count themselves unfortunate to have conceded a goal to Bennett that some might label a touch of genius; others might say it was a fluke. 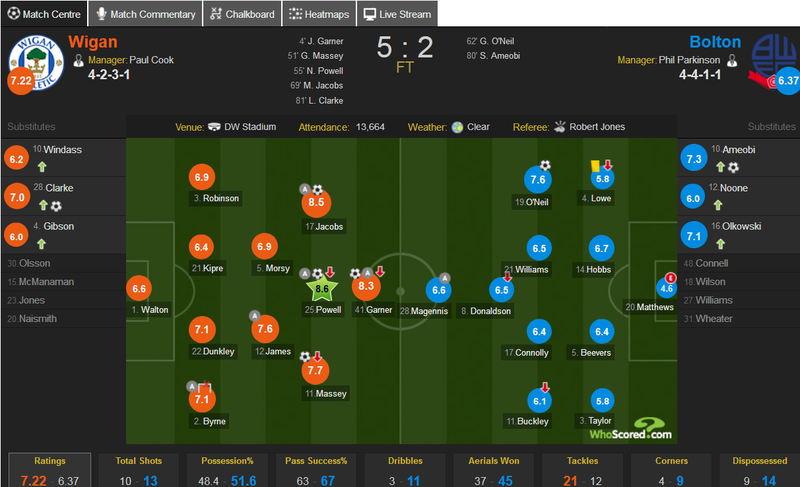 Wigan had their chances to win the game, but did not convert them, Leon Clarke being the principal offender in that respect. In his post-match comments Cook told us he had expected Jacobs and Massey to tire. Their pace and movement had reminded us of the tempo with which Latics had played early in the season. Both had been sadly missed but their presence could still prove crucial to Latics avoiding relegation. But knowing that both were going to be unable to complete the 90 minutes the manager did not have another winger on the bench to replace them. Kal Naismith had come on at full back for Fox and neither Callum McManaman nor Anthony Pilkington were on the bench. With the squad that Cook has at his disposal Latics are always going to be hard pressed to get a result against a team in the promotion race or one that is at the top of their form. But this is not the first occasion that they have been unable to beat teams that have been nervy and short of confidence following a bad run of results. It started in early October when they lost 4-0 to a Preston side which had been at low ebb. They just have not been able to capitalize on the opportunities presented to them since then. Having had some success with a back five in the previous outing it was a surprise that Cook ditched it, although it could be argued that his game-plan was working with Latics a goal up. Despite having one of his better displays against Middlesbrough Naismith was taken off after 60 minutes and found himself on the bench at Pride Park. It can scarcely have helped the player’s confidence and he was not at his best in this match. Having decided on a flat back four this time around, Cook retained his midfield trio of Reece James, Lee Evans and Sam Morsy. James did well but Evans and Morsy were distinctly below par. Evans in particular looked lost in his role in right midfield. 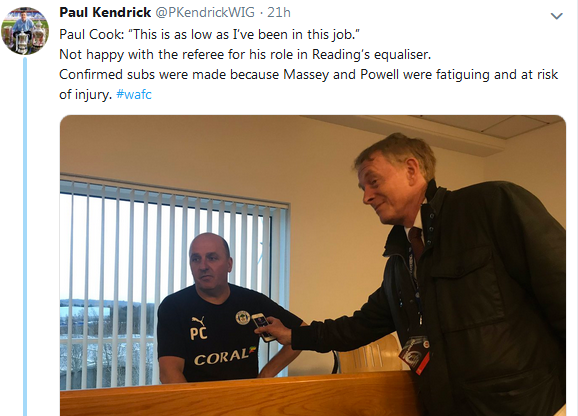 With a prior background in the lower leagues Cook has struggled with the tactical side of the game in the Championship. It scarcely helps that his assistant manager and first team coach come from similar backgrounds. With a relatively low budget squad he has to get the best out of the players at his disposal if the team is to compete and avoid relegation. He also needs to adjust his tactical approach according to the opposition he faces. Last season’s success was based on a 4-2-3-1 system, with a long-ball approach to 4-4-2 being the Plan B. Latics started this season successfully with 4-2-3-1, but injuries to Jacobs and Massey cut its effectiveness. Cook received some criticism for his tactics against Middlesbrough, packing the central midfield and using a backline of three central defenders, but a point was gained against a top team. Given the goals given away by a shaky defence over recent months it was a surprise that the manager had not employed such a shape in his previous starting lineups, particularly away from home. Latics’ set piece plays have been so disappointing this season. Lee Evans used to be the main taker of corners and free kicks but Reece James has since taken over most of those duties. The centre backs still have not scored a goal, despite the number of opportunities they have had. Nick Powell’s enforced absence from injury has surely had an effect since he is probably the best header of a ball in set-piece situations. A goal from a set piece is long overdue. Will it come at Reading on Saturday? Although the result did not go Wigan’s way there were some rays of hope emanating from the performance. The sight of Jacobs and Massey running at defences at pace from wide positions was most welcome, as was another short appearance for Nick Powell. Cook now has to decide how to approach the game at Reading. Will he continue with the ineffective Clarke at centre forward or will he opt for Joe Garner or even Powell in that position? One can only hope he will start with Jacobs, Massey and Powell and that Latics will go in with a positive approach. Should they get an early lead there remains the possibility of reverting to a back three/five later in the game, as the trio tires, with Jonas Olsson coming in off the bench. Should Latics manage to avoid relegation – which is far from certain at this moment – will Cook and his backroom team be in charge next season? The manager has been fortunate to have kept his job given the indifferent performances and results over these months. Should relegation occur then Cook’s experience in the lower divisions would prove useful. Should Latics stay up will Darren Royle continue to back Cook in the hope that he has learned from his mistakes this season? Latics started the season with a considerable number of players who had not played at championship level before. They too will have benefited from the experience, tough though it might have been. The Windass conundrum – can he fit into Paul Cook’s style of play? The words of Rangers manager Steven Gerrard after Josh Windass joined Wigan Athletic on the summer transfer deadline day. The fee was reported to be £2m. That same day Latics paid Ipswich some £1.25m for centre forward Joe Garner. Why did Paul Cook sign both when he already had Will Grigg and James Vaughan competing for the centre forward position? Cook clearly has a high regard for the 24-year-old Windass, but what were his intentions? Was he signing the Hull-born player as a central striker or one who would poach goals from wide positions? At the end of last season Cook had three central strikers in the senior squad. Over the summer he opted to send Devante Cole on loan to Burton Albion, leaving Grigg and Vaughan to fight for the position. Cook’s preferred formation involves one central striker, although he will sometimes throw on another in the second half if needs’ be. Garner is a capable and experienced Championship-level central striker and he will compete with Grigg and Vaughan, but where does that leave Windass? Not surprisingly, given the competition he is facing, Josh Windass has not yet started a game for Latics as a centre forward. He has been confined to the right or left wing. He has made 8 starts, Latics winning 3, drawing 1, losing 4 of those games. He has scored one goal, well taken against Hull City. Cook’s team last season was characterised by fast and decisive play from the flanks with pacey wingers and full backs pushed far forward. At its best it was exhilarating to watch. Gavin Massey was a key player on the right wing, his pace causing problems for opposing full backs, but his ability to perform the high press and to get back to support his full back underlined his contribution. The loss of Massey through a severe hamstring injury was a bitter pill for Cook to swallow. He had a potential replacement in Callum McManaman, but he too has had injury issues and not been at his best. In the meantime, Cook has used Windass and Michael Jacobs in wide positions, interchanging between right and left. Windass is not a natural winger. Too often he has looked like a central striker playing wide. But that position is by no means new to him. Rangers had used him there often. Was Gerrard being upfront about Windass’ decision to leave Rangers? The whole thing does not add up. What we have seen so far of Cook’s preferred style of play has been refreshing. Long-standing Latics fans would have said something similar about Paul Jewell’s football. PJ pulled a masterstroke by converting a centre forward with a low strike record into a left midfielder who was key not only in promotion to the Premier League, but staying there. Big Lee McCulloch was rarely going to beat a defender in his left wing position, but he worked hard in midfield and was a real threat at the far post with his heading ability. Jewell made a pragmatic decision to sacrifice speed on the left wing, for the greater good, McCulloch’s attacking threat in the air adding another dimension. Moreover, in Leighton Baines and Steve McMillan, he had attacking left backs with the ability to cross the ball with their “stronger” feet. Cook stuck his neck out with the signing of Josh Windass. His dilemma revolves around how to use the player most effectively for the combined benefit of the team. Would Windass be effective in that McCulloch role? He is certainly not a right winger but playing on the left provides him with opportunities to cut in for right foot shots. But that is a big part of Michael Jacobs’ game. Jacobs has been a key player for Cook. Cook surprised us at Preston by replacing an injured Nick Powell with Dan Burn, reverting to a back three. For a manager so passionate about 4-2-3-1 it was a paradigm shift. If he were to persist with such a system, there would be possibilities for twin strikers. Windass and Grigg would provide an interesting pairing. But one senses that Cook’s motivation was to bring Burn back into the fold than anything else. Given the hard times that Antonee Robinson has recently had it would not be a surprise to see Burn appear at left back. Cook has lots of thinking to do. Does he bring McManaman in to provide pace and balance on the wing or does he keep faith in Windass? Or is he willing to sacrifice 4-2-3-1 to accommodate him as a striker? Another, if less likely, scenario is at least one central striker leaving in the January transfer window. The team selection for the game against high flying West Bromwich Albion next weekend will make interesting reading.